Pediatric Canes, Pediatric Commodes and Accessories. 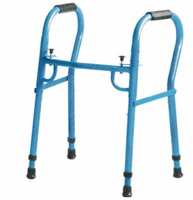 Scroll down to see our selection of Pediatric Equipment and Mobility Products for sale. Pediatric equipment is used by physicians to care for children. We carry a wide selection of pediatric supplies including pediatric mobility equipment, pediatric bathroom equipment, pediatric exam tables and an assortment of pediatric accessories. What is pediatric? Pediatrics is concerned with the health of infants, children and adolescents, their growth and development, and their opportunity to achieve full potential as adults. Pediatric equipment like walkers, canes and strollers help children with disabilities and functional challenges improve their independence and everyday function. Facility pediatric equipment like exam tables, scales and gurneys help to maintain a child’s health and wellness. The proper pediatric supplies can help your little ones grow to be everything they dream of..